OSLO — Tunisia's National Dialogue Quartet on Thursday urged the international community to make the global fight against terrorism an "absolute priority", as it was awarded the Nobel Peace Prize at a ceremony in Oslo. "Today, we are in a great need of dialogue between civilisations, and peaceful coexistence. Today, we need to make the fight against terrorism an absolute priority," said Houcine Abassi, secretary general of the Tunisian General Labour Union (UGTT), one of the four members of the Quartet. At Oslo's City Hall, which was decked out in flowers, Abassi denounced the "barbaric and heinous terrorist acts" in recent months in Tunisia and around the world, pointing to Paris, Beirut, Sharm El Sheikh and Bamako. The UGTT, the Human Rights League, the Confederation of Industry, Trade and Handicrafts (UTICA), and the Order of Lawyers orchestrated a lengthy and thorny "national dialogue" between the Islamists of the Ennahda Party and their opponents. "This year's prize is truly a prize for peace, awarded against a backdrop of unrest and war," said Kaci Kullmann Five, head of the Norwegian Nobel Committee. One by one, representatives of the four organisations held aloft the Nobel diploma and gold medal to a standing ovation from the specially invited guests, including Norway's King Harald and members of the Norwegian government. "Tunis!" cried one member of the audience. 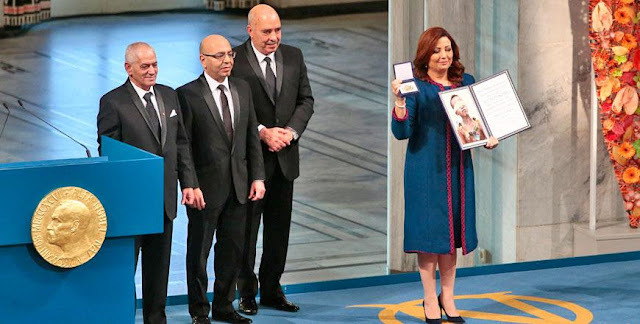 In honouring the Quartet, the Nobel Committee shone the spotlight on Tunisia as a rare success story to emerge from the Arab Spring, which had its beginnings in the North African nation. After hammering out compromises between groups initially diametrically opposed to each other, Tunisia successfully adopted a new constitution in January 2014 and held democratic elections at the end of last year. At the same time, uprisings in neighbouring Libya, Yemen and Syria have led to war and chaos, and to the return of repression in Egypt. Despite its successes, Tunisia's democratisation process remains fragile. After a suicide attack on a bus belonging to the president's security entourage killed 12 people on November 24 — which was claimed by Daesh militants — authorities have declared a nightly curfew in Tunis, temporarily closed the border with Libya and declared a state of emergency for the second time this year. "We are very worried because each time there's a terrorist act, some... say that if there's terrorism, you have to put human rights aside," Abdessatar Ben Moussa, head of Tunisia's Human Rights League, told AFP in an interview just before the award ceremony. "The best way to fight terrorism is to respect human rights," he said, echoing concerns expressed last week by Amnesty International. Earlier this year, the country was hit by two other major attacks: in March, 22 people were killed at the Bardo Museum in Tunis, and in June, 38 tourists were killed when gunmen stormed a beach resort. In July, a UN working group estimated that 5,500 Tunisians had left to fight in Syria, Iraq and Libya, flagging the country as having one of the highest numbers of people travelling to join such conflicts. Tunisia's economy has been hard hit by this year's attacks, with its tourism industry — which accounts for about seven percent of the economy and some 400,000 jobs — particularly struggling since the beach massacre. At the end of October, the number of overnight hotel stays had plunged by 60 percent from the previous year, official data showed. The other Nobel prizes, in the fields of medicine, chemistry, physics, literature and economics, will be presented at a formal ceremony in Stockholm later on Thursday. Each Nobel Prize consists of a gold medal, a diploma and the sum of eight million Swedish kronor (863,500 euros/$951,500), to be shared if there is more than one laureate.